Last night I was inspired by my daughters stripy jumpsuit to paint my nails. This is the result. Skyla was being very cute yesterday giggling and laughing, so I grabbed the camera and snapped a couple of pics of her (which is a good thing, because being #2 child there are only 1/10th the number of photos of her than of her brother!). Skyla has two nicknames at home, 'Poppet' (a name we started using after she was born) and 'Gaga', which is what her big brother calls her, as he can't seem to pronounce Skyla. So more often than not, she is now called Baby Gaga. 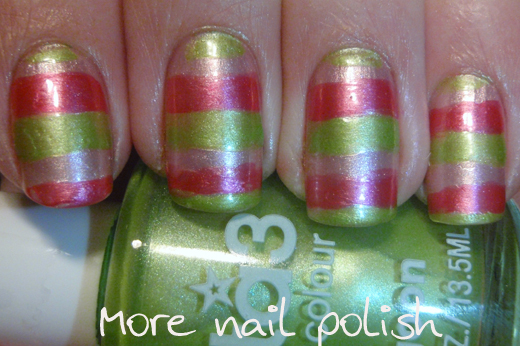 Polishes used in this were, base layer of Ulta3 'bon bon', then strips applied using Ulta3 'poppy' and 'lagoon'. The photos were taken under the bathroom light last night and appear a little bumpy, this is because they don't have a top coat. I wanted to leave it top coat free as I was going to put a crackle over the top. I'll show you those pictures tomorrow. Omg what a beautiful baby! It's cute she inspired your nails too! And I love the mani as always. She's freakin' cute! And makes for a lovely inspiration =D haha! Love your nails! Awesome combo =) Looking forward to seeing it under crackle! Aww!! Your baby Gaga is super charming~<3 Your nails are so cute too:D It's matching to her outfitXD So adorable~!! You baby Gaga is gorgeous!!! Very big big blue eyes. Very cute!!! I'm not too into the green color actually. But after seeing your baby and the mani together, I love it. I like the name for Skyla! And she is sooooo beautiful! She is so cute and I love big brother's name for her. Cute mani to match! She's so cute! I love the matching manicure too. 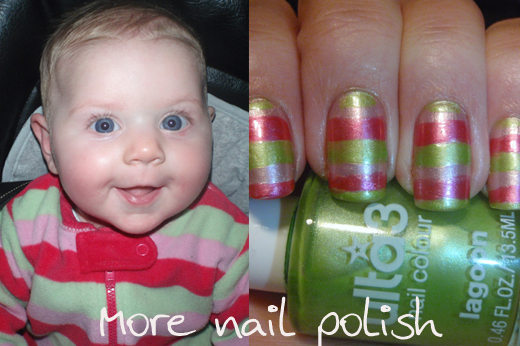 awwww so cute, both the baby and the nails! nice post also its Dr.'s Remedy all-natural organic baby nail polish is safe to use during pregnancy and a great option for anyone looking for natural beauty products.